When certain people ask me to make treats for them, I panic a little. I like to make random treats at random times, but sometimes I’ll make them with a specific purpose in mind. 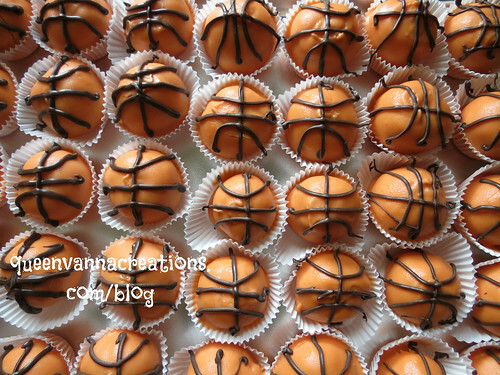 Friends asked me to make Basketball Cakeballs. First stresser, the balls should all be the same size. And then, I tried to make them look like basketballs. Not too shabby for an amateur! Then while I had a good inventory of those melting wafers, I dunked some oreos, too. Next up I’m making some “Party Hats” for a fun chex mix, and getting ready for a little vacation! This entry was posted in foooooood, she's so crafty and tagged ball, balls, basket, basketball, cake, cakeballs, cakepops, oreo, oreos, pops, snacks, vacation. Bookmark the permalink.